Shoreline Marine Contracting is a family owned and operated business that has been serving lakeshore customers on Big Green Lake and Central Wisconsin for over 30 years. Over this period of time we have acquired and assembled the best waterfront products – boat lifts, piers, dock accessories, etc. – available on the market with the most qualified and professional staff to represent and service these products. In doing so we are the best qualified to guide the homeowner in making the right choices for their waterfront boating needs, whether it be a new stairway down to the lake, a new fabricated pier, a new dock layout, or a new boat lift. We are the authorized servicing dealer for Shorestation and Sunstream boat hoists, and for Pier Pleasure and Shorestation piers. 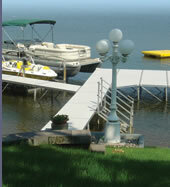 The Wisconsin DNR has recently passed new legislation restricting the construction of docks and piers. DNR website on this new law. Shoreline Marine Contracting is currently expanding to meet the demands of our loyal customers. If you require plowing or snow removal services please contact us for a free quote. © 2019 Shoreline Marine Contracting Designed & Hosted by i.t.Interactive, LLC.